Will Alumilite melt hot glue? Hello, I have the above question, Will Alumilite melt hot glue? 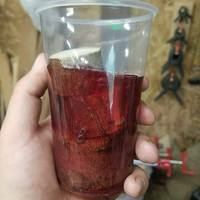 Reason I ask this is because I made a mold from a piece of HD plastic cutting board and plastic coragated board, hot gluing both together and then put that and the turning blank in my pressure pot. I was going for a resin/wood hybrid turning blank but when I opened the pressure pot the next day, all the alumilite had leaked out to the bottom of the pot. I am just trying to eliminate the possibility that the resin heated up too much and caused the glue to fail and leak. I more than likely didn't get the mold sealed enough or something popped when putting the mold into the pot. I suppose it could soften it enough to let some resin leak through... it wouldn't melt it in that small of mass. The Alumilite Clean Clay is a good mold box sealer or using a disposable plastic container that wouldn't have to be sealed. Of course a silicone mold make is always a good option, making sure you degas the silicone when making the mold if it will undergo pressure. consumer hot glue guns are set to 250F. If you create a situation where the curing resin overheats it could go into a thermal runaway and get up to 400F. Was just answering another thread about this. So be mindful that its not happening. Also remember pressure tanks can do weird things, like if you have bubbles in your dried glue it can "pinch" the glue under the pressure and cause separations. But if you're like me you probably just missed a spot on the seal ha ha.. good luck and be careful, always. Have an awesome weekend!